[Nigel’s] been trying out a series of designs and materials to make his own bounce flash. He set out on this mission because most of the images he used flash on ended up washed out with dark shadows. The flash add-on seen above seeks to curb the harshness of the direct light but shielding the subject. What you see above is just a couple of pieces of paper. [Nigel] put together a template so that you can cut your own. Although the design is his favorite, he also put together a second generation that is built from hobby plastic with a piece of aluminum tape as the reflecting surface. The main link at the beginning of this feature leads to that version, but after the break we’ve included direct links to each article he published during his experimentation. I’ve seen these as commercial products. Nothing really new, but useful still. The advantage to a homemade version is that you don’t have to stick with those made only for the expensive/higher end DSLRs. The commercial ones are also made to attach via the external flash hot shoe. So, if your camera doesn’t have one of these (i.e. 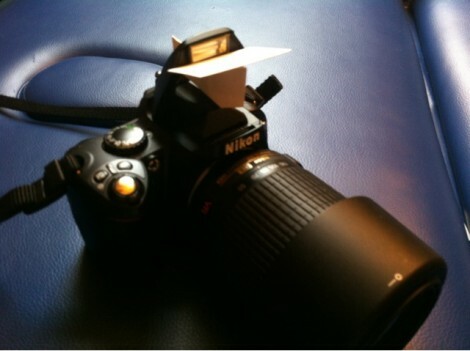 not a DSLR), then a DIY version is necessary. The downside to this is that my wife doesn’t want to install one of these every time she pulls the camera out to take pictures of the kids doing funny/cute things during the day. Now I feel like an A-hole. He links to a commercial product in his first post about this. On the plus side, I enjoyed reading how he developed the most recent version, along with the template to get me started making one for my wife’s P90. Flashes are pretty good at making things look horrible. A remote flash, at some distance from the camera is a good way to go. Bounce can be problematic if the ceiling is high or not white. I did something similar by adding a diffuser to my camera’s built in, pop up flash. A great source for material is broken LCD panels, they have really nice, flexible diffusers, and you will have a lot of material to work with. Mine fold flat, and fit into a filter case nicely. I did this too with some plastic from a flexible binder and cut it to snap into the hot shoe behind the pop-up flash and fold flat. His design looks much sturdier since it has supports unlike mine which just has a fold to create the angle. I don’t use it much because the shape isn’t perfected yet and a hard flash can sometimes be seen and it looks ridiculous. Yeah, be careful with this. I’ve set more than one piece of paper of fire because it was too close to my camera flash.